In downtown Eugene, OR, in an industrial brick building is a cute cider tap room with concrete floors and ceilings of exposed wood beams and hanging Edison light bulbs that all make Wild Craft Cider Works look like it could easily be a neighborhood spot in LA or Portland. It’s a cute spot and the food menu was small – just about 5 or 6 items on a chalkboard at the bar. I was mainly interested in the sausage flatbread, but by the time we could order our food (about 8pm), they had run out of everything and most items had been crossed off the menu. The only thing that was left to order was the polenta with mushrooms. When it came out, it looked pretty good! 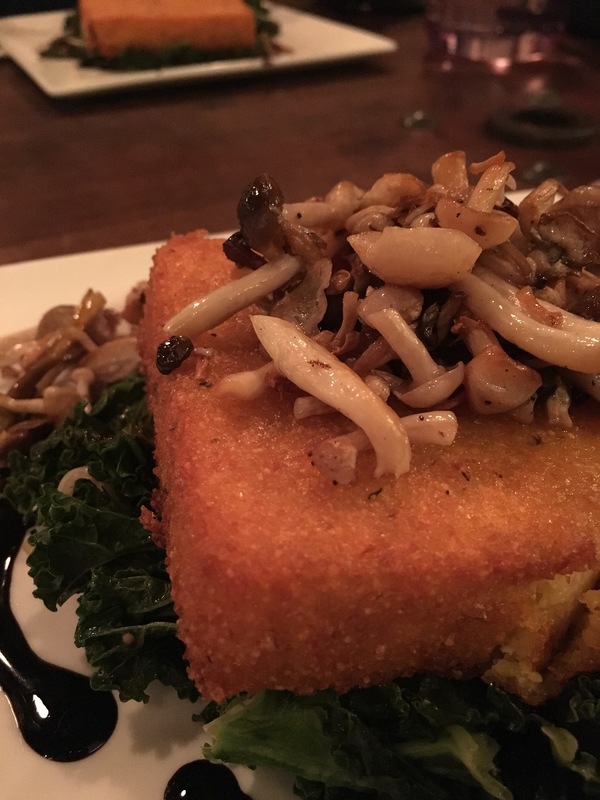 The crispy polenta cake in a perfect square on top of a bed of kale, drizzled with balsamic and topped with mushrooms. I bit into the polenta cake and immediately noticed that it was salty. Like really salty. Not savory, but salty. Like swimming in the ocean and get a mouthful of sea water salty. It was so salty, that even trying to mix it with the bitter kale or the tangy balsamic was a lost cause. That polenta cake was hell-bent on giving me hypernatremia (and, yes, I DID Google that word just to write it in to that gem of zinger). Rachel valiantly finished hers, but I simply couldn’t get through even a quarter of mine. It was like eating a pure salt lick. Luckily, it seems like the menu is seasonal/rotating on a nightly basis, so perhaps this was just a fluke. Or at least here’s hoping. The only remedy we could think of was to go to Jack in the Box afterward and get a Jr. Bacon Cheeseburger. You know, for some flavor.